Greece is known as the home of some of the most important historical sites in the world, and it has more than 5000 islands. It also boasts of nature such as forests, sparkling ocean waters and a rich culture which makes it one of Europe’s top destinations. Some of the popular destinations in Greece include the following. This dramatic isle is made up of unique white cubic buildings which have been made into boutique hotels. It is popular for people who are looking for a romantic destination to have a wedding or honeymoon. It is also known for its volcanic sand beaches and archaeological sites. 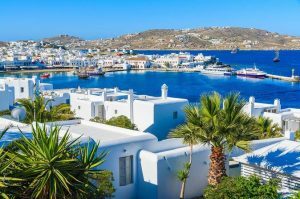 If you enjoy seafood and a dose of live music, then Mykonos town is the place for you to be. It also has perfect beaches on the South Coast that can be accessed by taxi boat and bus. There is also an airport which connects tourists to Piraeus, Rafina and Athens. There have been celebrities who had their honeymoon in Mykonos and enjoyed it. Located in the mainland of Greece, Delphi is listed as one of UNESCO’s world heritage sites. It is considered one of the ancient sacred sites where pilgrims would come to worship. Also popular in Delphi, is the archaeological site which displays collections that chronicle the origin of civilisation. This is the biggest Dodecanese island. UNESCO has listed Rhodes town as a top tourist destination which is known for its impressive towers and active nightlife. The streets are always devoid of cars, and you can enjoy a brisk walk as you enjoy the Greek culture. Also known as Zante island, Zakynthos is one of the busiest tourist attractions in Greece. It is relatively easier to access, as there are always boats to take people around. People who love to scuba dive and snorkel prefer it as a destination to stay.